This is the last block for our quilt for 2017! It's our fourth year of our Exclusive Free Mystery Block of the Month by Pat Sloan! This year Pat's theme is 'The Children’s Library'. Each month Pat will share a favorite childhood book that needs to be in our library. Each month is a new book (or series) that is loved by so many. The Mouse and the Motorcycle might not be a book you had as a child, but I own my copy and I love the story. It’s about having a dream (the mouse wants to rid a motorcycle) and finally having that dream come true. The family that stays in the hotel has a little boy with a toy motorcyle. They become friends, they lose trust, and Ralph the mouse has to win back the trust. It’s delightful and for a bit older child as it’s more of a novel, like reading Alice in Wonderland would be. But the part I’ve really loved this year is learning about the authors. 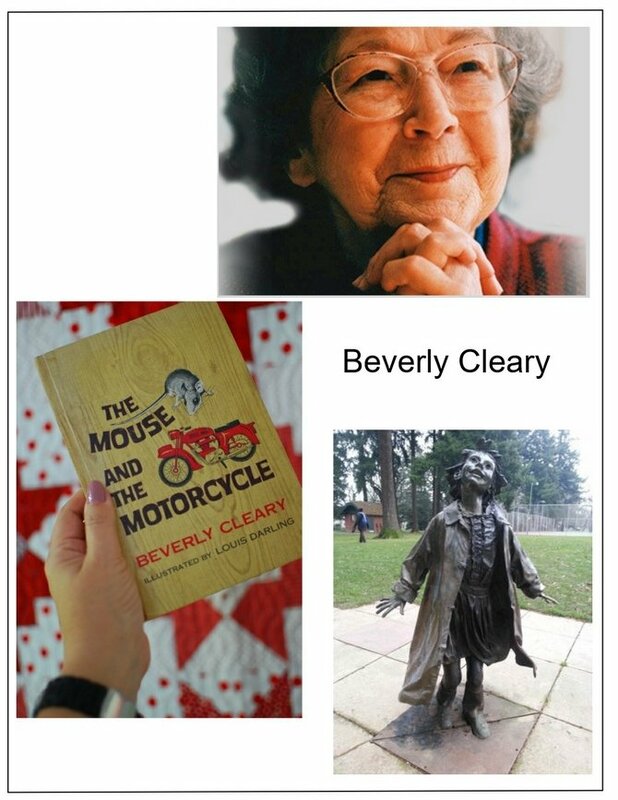 I learned that Beverly Cleary started to read very early. She had a childhood teacher who told her that she should write books for other children, and she did! There is a link to a lovely interview with Beverly from her publisher’s website. She says she wrote books about the childhood she knew and grew up in. About the towns and the people there. When her town decide to create a statue to celebrate her work, she was given the honor of selecting the artist to create them for Grant Park in Portland OR. What a fun way to celebrate a children’s author, by putting her characters in the park full size for others to see! From wiki - “Cleary's books have been historically noted for their attention to the daily minutae of childhood, specifically the experience of children growing up in middle class families.Leonard S. Marcus, a children's literature historian, said of Cleary's work: "When you're the right age to read Cleary’s books you're likely at your most impressionable time in life as a reader. Her books both entertain children and give them courage and insight into what to expect from their lives." Cleary's employment of humor has also been noted by critics; Roger Sutton of The Horn Book Magazine notes: "Cleary is funny in a very sophisticated way. She gets very close to satire, which I think is why adults like her, but she’s still deeply respectful of her characters—nobody gets a laugh at the expense of another. I think kids appreciate that they’re on a level playing field with adults." And, Beverly is 101 years old right now, she is living an amazing and long life. 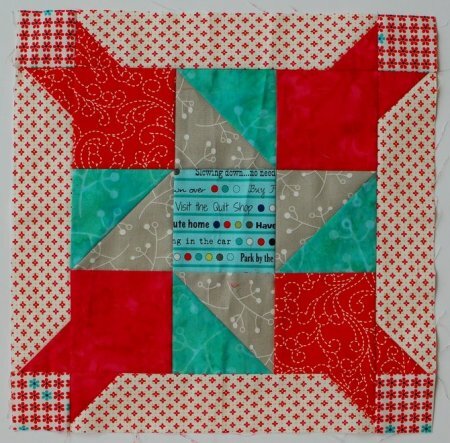 CLICK to see Pat's second colorway and share your block in Pat's Quilt Show! NEXT MONTH we share our completed quilts and Pat will have a giveaway to someone that has a top finished! PLUS a reveal of the 2018 theme! 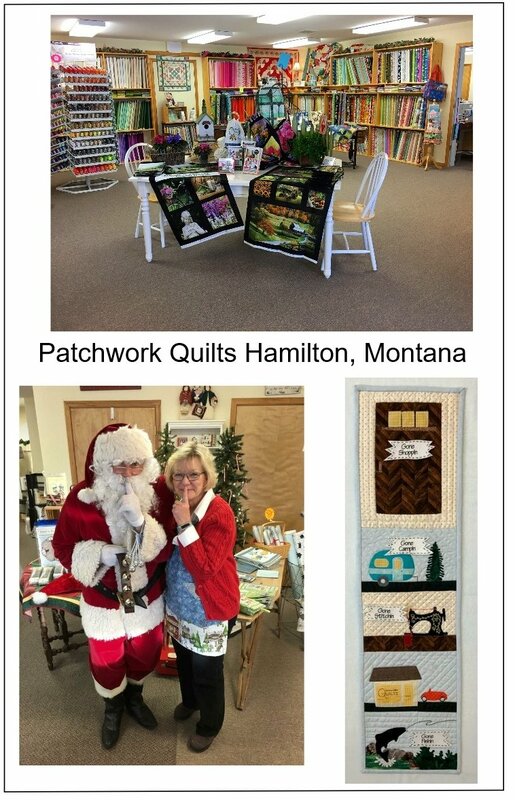 Patchwork Quilts is located in the georgeous Bitterroot Valley of western Montana in the town of Hamilton. Patches (or nickname) is a bright, cheerful shop offering over 2,000 sq. ft. of fabric and quilting supplies. We sell fabric, notions, patterns, gifts, and much, much more in our store and online. You will love how easy it is to navigate around our website when shopping online. Fabric is conveniently listed by Line (Collection), Manufacturer, AND Type. Notions and other products are listed by category and subcategories for added shopper convenience. To assist you in picking the perfect fabric, we have also added a Design Wall to our website. For those of us “Vintage” quilters suffering from arthritis, poor vision, and reduced mobility, we carry a multitude of sewing aids and notions that will enable us to continue working on our crafts with less discomfort. Our store also features a large 1,000 sq. ft. classroom area where we teach sewing and quilting classes. We even have a longarm machine and provide custom quilting services. Owner, Claudia Williams, has been sewing since childhood and graduated in Clothing, Textiles and Design from the University of Idaho. She feels fortunate to work in an industry where she is surrounded by creativity everyday. 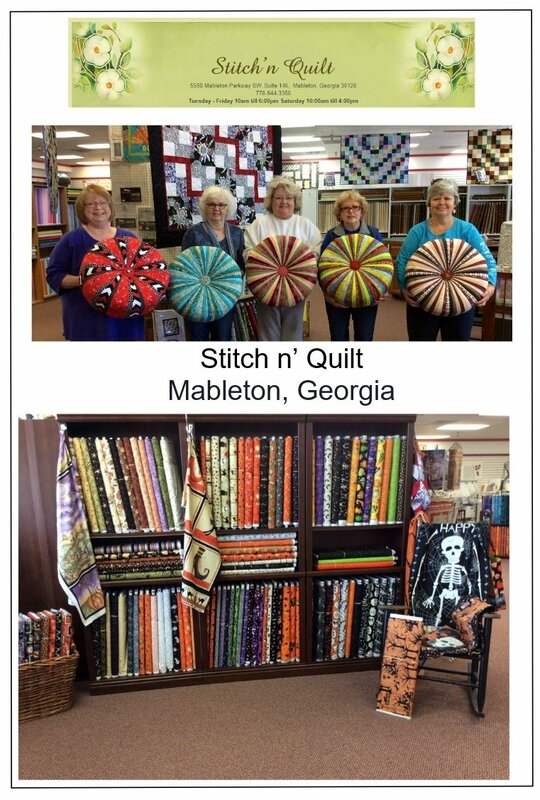 Here at STITCH’N QUILT, we've been sharing our love of quilting with the community of Mableton, Georgia, since 2009, offering “southern style” service and a large selection of quality fabric and quilting supplies. Conveniently located in the Village at Mableton Shopping Center, just fifteen minutes from downtown Atlanta, our shop boasts a cheery atmosphere and well-lit interior for ease in fabric color selection. We pride ourselves on our product variety and the camaraderie that exists between customers and staff…everyone who walks through our doors quickly becomes a friend! The comfortable environment lends itself well to the fun, no-pressure classes and club activities offered. From beginners, to more advanced quilters, there are opportunities to learn, share and socialize. Long arm quilting services are offered for those who don’t have the time to finish their quilt tops, or don’t have access to a long arm machine. It’s just one more way we strive to help every quilter get more enjoyment from the craft. We feel so fortunate to work in an industry where we can share our love for quilting with others and enjoy the creativity and fellowship of the quilting community! Do you have a favorite memory of reading The Mouse and the Motorcycle? What do you think of the block design? I'd love to hear your thoughts!